1. Book deals for Thorn of Dentonhill, Holver Alley Crew, and Maradaine Constabulary. If we're really aiming pie-in-the-sky, this deal will involve the same publisher and all three at once. That would be very nice, indeed, Universe. But in the case of all three, I think I've really done what I can do, and it's past time to be focused on the Next Project. 2. Finish Rough Draft of Way of the Shield. I should have finished this last year, but between various rewrites of the other three, a hectic summer and a few other things on my plate, it didn't come together. Part of that was due to a flawed outline, which I think I've got a handle on now. I understand why it wasn't working, which is a big hurdle to clear. Time to drive it forward. 3. Finish Rough Draft of Banshee. This is a project that's gone through significant conceptual changes over the years (you may notice that it's no longer USS Banshee, which is one major shift), but I've finally found an angle that combines character, plot and worldbuilding in a way that works pretty well, at least so far. 5. Have a good reason to start second books of Thorn, Holver Alley or Constabulary. See point 1. 6. Hash out some of these random ideas into usable outlines. Because if I accomplish 2 & 3 before I accomplish 1, I'll have no good reason to do 5. So I'll need a new "new project", as it were. 7. Never give up. But this one's a given. So, a year ago I put out my goals for 2012, for which I can say: some came to pass, some not so much. I still don't have a book deal, for Thorn, Holver Alley or Maradaine Constabulary. However, I can honestly say I feel like I'm a lot closer on those. All three of those were re-drafted or fine-tuned, so this year I have finished-until-a-paying-editor-tells-me-otherwise levels of drafts for all three. I got a really excellent rejection letter for Thorn. So for the first three goals, I'm still a bit short of the line. Number 4: Finish Rough Draft of Way of the Shield, did not come together. I see now that my initial outline for it was woefully flawed. In outline, it was a politically-themed murder mystery, but that was far too thin. It needed scope, grandeur, and more antagonists who had a clue. I need to get back in there and work out the details. I've had recent epiphanies that made things gel in my head. Now I need to get them onto the page. I did do more outlining and worldbuilding-- and some scene writing-- for what Banshee has morphed into. I feel good about how this is coming together. The bits that I have written, I really like. But I need to solidify the outline before it really starts to live and breathe as a novel. The finale is still something of a mystery to me. Also, had Out of Ink produce one short play, wrote another for this year's. I wrote an actual short story that I feel pretty good about. ArmadilloCon and the Writers' Workshop went very well. All in all, 2012 went strongly. Not as well as I would have liked, but still: progression on the writers' path. That's good, though. It serves as a humbling reminder that I can always do better. It's the nature of sci-fi and fantasy to go big, and big means a cast of "main" characters in the dozens, and hundreds of minor characters. And, as much as I love that sort of thing, it is in this very aspect that a lot of said big, sprawling epics just lose me completely. Because the writer doesn't necessarily get me to give a good damn about who these people are. I'm going to pick on a specific example, in that it was one that didn't work for me, personally. I know there are plenty of people who love it, of course, but I'm not one of them: The Honor Harrington Series. Now, I liked the first book fine, and several of the subsequent books. But over time it lost me, and I think a large part of that was the enormous sprawl. The shear volume of characters involved is incredible, and I salute anyone who can keep track of all that. Frankly, there wasn't a character I really connected to, really felt endeared to, besides Honor and Chief Harkness. Chief Harkness is a minor character, but he was a lot of fun, and in In Enemy Hands, he plays a key role. * Whenever one of those two characters were center stage, I enjoyed things. When they weren't, not so much. And even though Honor is the main character, she is not center stage a lot. The following book, Echoes of Honor, is structured in alternating sections-- one section details Honor, Harkness and others on a prison planet, the other section just... other stuff. Slogging through those sections was rough, because I just didn't care about who was on the ruling council of Manticore or the People's Republic (especially since those people were A. relatively disposable, B. easily interchangeable and C. by design, horrible and stupid.) Now, of course, in both cases, these are the "bad guys" of the novels, for all intents, and you're not supposed to "like" them. But you should be able to enjoy them, and I didn't find any of that. And, frankly, many of the characters I was supposed to "like" I didn't find particularly engaging, either. So, for me, HUGE parts of that book, as well as many other books in that series, lacked any hook. These people could live or die, and I really didn't care, as long as they never had another meeting. Now, why didn't I care? Was this my fault as audience, or the writer's fault? I can take some of the blame, and I don't want to attack Mr. Weber in any way, but I think a lot of it has to lie on his shoulders. As for why, I think it ties into what I talked about on Monday-- when it comes down to it, I don't think he believes in his antagonists. By this, I mean, he sets them up as strawmen to fail. When they argue their positions, it's usually a flawed, if not downright stupid argument. They enact plans that the narrative tells us is doomed to failure. They're not just playing checkers while Honor and her allies play chess; they're just flinging the checker pieces at her king and don't understand why that doesn't mean they win. I'm exaggerating for effect, but the point stands: they aren't people, at least I don't feel the author believes in them as people. And if they aren't people, I can't invest in them. And this ties into where I was going wrong with Shield. My two main antagonists were weak. One was a strawman of wrongness; whatever your personal political leanings are, imagine an absurdist, reductive take on that. And the other one was a cynical user of the first one. He might as well have a tattoo on his forehead: "I AM USING YOU AS MEANS TO MY OWN END". That's not what I needed to make Shield an interesting book. I needed these guys to be the heroes of their own stories. One of my favorite bits in Thorn of Dentonhill involves only the antagonists. It works, in my humble opinion, because I did my best to make them their own characters. I haven't-- yet-- succeeded on that same level with my Shield antagonists. Maybe I need to figure out what's the story is that they are the hero of. *- But even still, I had to go look that up. The fact that the name of the character I liked the most who wasn't the title character wasn't in my brain signifies something. It might be my failing memory. So, I was reading back through what I had written for Way of the Shield, trying to figure out what wasn't working, and why it wasn't. I am still most likely to keep my attention focused on Banshee, but the problems with Shield are now becoming clear. Part of the problem stems from the fact that I was thinking more about the long-game instead of this book as it's own standalone. There were choices that, in essence, I wasn't letting myself make because they weren't fitting my predetermined plan. It was the writing equivalent of not moving any chess pieces because I was saving them for later. And the real problem with that boiled down to this: that's not who Dayne was. Dayne is the throw-himself-on-a-grenade type. And in not writing the story with that same hell-bent care, it wasn't working. This is, of course, the potential problem with outlining in general: letting it be a trap. I know more often than not I've caught myself thinking, "I can't have that, because it goes against [future plot point that I haven't actually written yet]." Why was I beholden to that? Because I had a plan. Now, this tends to be the argument of those who prefer not to outline: if I outline, then I'm STUCK. I'm LOCKED ON THE PATH. And this isn't true. But it is sometimes challenging to see that straying from the path can lead to a clearer road once you're already lost in the woods. The other problem I was having stems, to a degree, from the outline as well, in that in the outline, my antagonists were not well-defined. So, at least in this work-in-progress rough draft, they were coming off as one-dimensional strawmen. They were just wrong people who were wrong in thinking wrong things wrongly. They were only the heroes of their own story if you accept that their story was about stupid people. And that's not interesting. So that's my challenge, before diving back into that project (eventually): figuring out who the antagonists REALLY are, and from that, how they'll implement their goals, and what the consequences of them doing that are. And to be willing to have real consequences hit my protagonists. Because, when it comes down to it, I was essentially protecting a "status quo" that doesn't really exist yet. Why do that? Parts one, two and three. The third act of the Xindi Arc is pretty action packed. On some level, it does make up for the heel-dragging and aimlessness of the first two thirds: Episodes are: "Hatchery", "Azati Prime", "Damage", "The Forgotten", "E2", "The Council", "Countdown" and "Zero Hour". Of these eight, really only two are inessential: "Hatchery" and "E2". But both of them do speak to the character of the Enterprise crew. Since the one character-arc that's really tied to story-arc is "How far will Archer go? ", to a degree "Hatchery" answers the question, "How far will the crew let him go?" Now, it approaches it from a different angle, where Archer goes to extreme measures to help a creche of Xindi-Insectoid infants, and the crew, sensing something wrong, engage in a mini-mutiny. As Archer is Being Affected By Something (a Trek staple to avoid actual conflict or responsibility), the real conflict boils down to the crew vs. Major Hayes, since Hayes just follows orders. This is also the closest thing we get to something resembling focus on the Xindi-Insectoids, who in terms of story never amount to actual characters, simply additional muscle to back up the Reptilians. "E2" is a kind of fun what-might-be time-travel episode, where the crew meets their descendents from a failed future-version of their mission, but other than turning the screws a bit tighter on the Trip/T'Pol romance, it's largely a placeholder. That said, the three in between those episodes, "Azati Prime", "Damage" and "The Forgotten" do a very nice job illustrating the Collapse-Retreat-Recovery aspect of the Twelve-Part structure. The ship is really hammered, but at the same time Archer makes some connection with Degra and the other Xindi-Primates. It's here that the core Trek principles are pushed to their limits: having discovered the Xindi world-destroyer weapon, the first plan is just to blow it up. This goes wrong, and Archer gets captured, but in being captured, he uses his knowledge from "Stratagem" to his advantage. This convinces Degra enough to at least listen, and stop the Reptilians from attacking the Enterprise. Degra (with the help of the semi-enigmatic Aquatics) returns Archer to the broken ship, and sends message for a secret rendezvous a few light-years away. The ship being in such a state, making that rendezvous is impossible without a new warp-coil. Fortunately, there's another damaged ship nearby, and Archer feels forced to take theirs by force in order to make the meeting. This is without question his lowest point, committing for all intents an act of piracy in the name of saving Earth. It's very non-Trek, which works excellently for the sake of drama. Capt. Archer is torn up to do it, but he feels he has no choice. You could easily see, for example, Cmdr. Adama, John Crichton or Malcolm Reynolds doing the exact same thing under the same circumstances. The only question is, would they feel the same weight? As horrible as the act is, it is in service of, ultimately, a Trek-solution: solving the Xindi situation through dialogue instead of violence. Of course, the cracks in the plotting armor are quite evident. Degra could have this clandestine meeting somewhere easier for Archer to reach, given that Degra knows the state Enterprise is in. He even could just go to Enterprise directly, and not even be clandestine. The need for secrecy from the Reptilians (and Insectoids) is a bit artificial. And that's a big part of the problem with this plotting, in that it forces Enterprise to go from Point A to Point B (this necessitating the stolen warp coil) and then from Point B to Point C (this using the subspace passage that creates the timetravel accident in E2, which is neatly avoided, meaning the second Enterprise may have "never existed".) It's mostly hoop-jumping so Degra can use Archer as a surprise in "The Council". "The Council" is, in theory, Archer presenting his case that Earth is not a danger to the Xindi and that the Sphere-Builders/Guardians have been playing the Xindi for their own purposes. It's the latter point that is most crucial, since the Guardians are worshiped as deities by the Xindi, though they were unaware of the connection between the Guardians and the Spheres. While the Xindi Council has five groups, really only three matter: the Arboreals back up the Primates, and the Insectoids back up the Reptilians. And the Aquatics are the enigmatic deciders. In terms of character, it really boils down to Degra (Primate) and Dolim (Reptilian). It should be noted that Randy Oglesby and Scott MacDonald deserve a lot of praise. Both are journeyman actors who have done tons of guest roles on various shows, including all four of the modern Treks. * They do solid work, often under a lot of latex, and you have to respect that kind of actor. In fact the real dramatic centerpiece of "The Council", and to a degree the turning point of the story arc itself, is between these two actors. The final wrap-up of "Countdown" and "Zero Hour" is serviceable, in that the Xindi-Reptilians cement their role as the irredeemable villains, who have tied themselves to the Guardians. The Guardians, of course, want to reshape reality-- terraforming our space, as it were, to one that they can survive in. The Reptilians are their willing dupes. Even the Insectoids wise-up, though all they do is wonder why the Spheres are suddenly working to help their efforts to destroy the Earth before the Reptilians sudden-but-inevitable betrayal. The final push, in which Archer enlists Reed and Hoshi to destroy the weapon, saving the Earth, while Trip, T'Pol and Phlox destroy the Spheres themselves, saving the Xindi (and all of reality)-- is entertaining and fun, but sadly mostly involves pushing buttons and punching aliens. The highlight in terms of What-Makes-It-Trek is not the bit where annoying-time-travel-exposition-fairy Daniels pulls Archer to the founding of the Federation (to convince Archer not to sacrifice himself, something Archer is pretty hellbent to do). Instead, it's the moment where the Andorians show up to help defend the Earth. Jeffery Combs-- another strong member of Trek character-actor stable-- sells the hell out of it as the Andorian Commander Shran, and that's a lot of fun. But in the end, it's a Big Finale: Things go Boom, and the Day Is Saved? Is that all there is? Is that all there can be? That's the big question remaining. *- I'm fairly certain that the two of them and Jonathan Frakes are the only actors to appear in all four modern Treks. A continuation of my analysis of the Xindi-arc of Star Trek: Enterprise. Parts one and two. So, onto the middle third of the arc, things should pick up? Should, yes. But doesn't. This middle third batch of episodes are: North Star, Similitude, Carpenter Street, Chosen Realm, Proving Ground, Stratagem, Harbinger and Doctor's Orders. Of this batch of eight, only three do any heavy lifting in terms of the arc plot, and they're back-to-back-to-back: Proving Ground, Stratagem and Harbinger. The rest are very mushy mushy-middle stuff. The two biggest missteps are North Star and Carpenter Street. Strictly speaking, Carpenter Street does do some arc-work, but it's not compelling. Both these bits suffer from having an "neat idea" supersede what the story arc really needs. In the case of North Star, it was doing an old-school, Original-series style of episode where they come across a planet that's a History Planet instead of an alien world, in this case, the Old West, and it doesn't tie to the Xindi arc at all. It's disposable. For Carpenter Street, it's having the characters time-travel to modern-day Earth. For that, it does tie to the arc, in that they go back to stop Xindi Reptilians in Earth's past who are preparing the biological weapon. The time travel is so incidental for both parties, it's pure handwavium, and raises more "If they can do that..." questions than the arc wants to answer. It does, in the end, provide Capt. Archer with something tangible, and that proves important later... but that could have been achieved without the time travel mess. Chosen Realm is largely disposable, but it throws a small long-term setback into the mix by having all the data they've collected on the Expanse and the spheres deleted from their computer. It's only small because it doesn't seem to slow them down significantly. It also introduces the idea of Who Built The Spheres, and that said Builders might be worshiped. Similitude and Doctor's Orders are also relatively disposable, but both of them are, at least, nice character pieces. Similitude again pushes the character-arc question for Capt. Archer: how far will he go to succeed? In this case, he allows a sentient being to be born and live for a short period of time in order to save Trip's life, on the principle that he cannot succeed without Trip. The plot requires a lot more of sci-fi handwavium (Dr. Phlox happens to have a Morally Questionable Miracle in the back of his cupboard...), but it works if you can swallow that pill. Doctor's Orders is fun enough, carried largely by John Billingsley's charm. It does built off the idea that the Spheres are Changing Space, set up in Harbinger, so that helps give it some purpose. Fortunately, Proving Ground, Stratagem and Harbinger do some good work. The first two bring the Xindi and the Xindi Weapon into focus, largely through Degra, the Xindi-Primate who is responsible for actually designing the weapon. An excellent job is done in these episodes changing him from a Nameless Councilmember to a real character, someone who has agreed to do something terrible because he believes it's necessary. Strategem in particular, is a fun exercise, because it plays the "You don't remember but it's been a few years and we're friends now" trope in reverse-- having our protagonists be the perpetrators of the trick instead of the victims. But in doing so, Archer gets to know Degra the Man, as opposed to Degra the Weapon Builder, which also helps shift things towards a more Trek-oriented Final Solution. Harbinger, of these three, does suffer somewhat because it feels more disposable than it actually is: it's mostly character work, filling the time from the travel-with-purpose to Azati Prime (the location of the weapon construction, learned in Strategem) to work on character subplots. It turns the screws on the Trip/T'Pol romance, as well as the Reed/Hayes hostility. And, as mentioned, it sets up the Real Villain: The Sphere Builders. In doing that, the stakes are changed. However, one should avoid having the word "disposable" being used too much, especially in the middle third of a storyline. It leads your audience to wander away and say, "I don't know what's going on, really". And who wants that? In terms of twelve-part structure, I feel like this only really brings us to Part Five: Payback (with the Sphere Builders being brought into play showing the real stakes). Five/twelfths of story when we're two-thirds in? Problematic. But it does offer the opportunity for a fast-paced final act. First of, let me say I'm going to be talking about Cabin in the Woods here. So, because this is a movie that it matters for: there will be SPOILERS for Cabin in the Woods. After watching this movie, it sparked a very specific memory from back in college. No, I didn't go on a doomed camping trip. But I did try my hand at writing a by-the-numbers horror script, just to see if I could do it. The result was a script called Stacks of Evil. This was in '94. Watching Cabin in the Woods reminded me just how by-the-numbers Stacks of Evil was. It hit every single point that is part of the Cabin in the Woods sacrifice ritual. For the folks Downstairs in Cabin, the events of Stacks would have served perfectly. Though it would have been a woefully mediocre movie. But seriously: five college friends (A Good Girl, A Bad Girl, A Jock, A Brain and a Drunk, aka The Virgin, The Whore, The Athlete, The Scholar and The Fool) all decide they are going to sneak into the school's library to spend the night. Why? Because, that's why. They press on despite the warning of the janitor (The Harbinger). After some partying in the library, the Jock and Bad Girl split off, and the Drunk wanders off. The Drunk, specifically, commits the Transgression. He breaks into a locked room and knocks over a jar that houses a vengeful demon. The Demon then kills the Bad Girl, the Jock and the Drunk, in that order. The Brain and the Good Girl manage to figure out what's going on, and how to potentially stop it, until the Brain is killed, leaving the Good Girl alone to fight the good fight and survive to be the Final Girl. Because that's how it's done. And I totally had it down that that is how it's done back in '94. Because I knew my horror tropes. After watching Cabin, I went into a TV Tropes hole for a bit, reminding myself about not only horror tropes, but sci-fi and fantasy ones. One thing I love about the Tropes page is the reminder that "Tropes are not Cliches"-- these are the broad brushstrokes of storytelling archetypes. Whether a writer makes them cliche is based on what they are doing with them. With Stacks, I was pretty much trying to be as cliche as possible. Cabin shows one can take those tropes and do something fresh and clever with them-- even with the fact that they ARE tropes in the first place. *- Namely, after the Virgin "wins", there's a final "Jump Scare" where the demon comes back up, but then the film crew rebels and declares the whole thing ridiculous and goes home, leaving the demon decidedly unscary without special-effects backing him up. Kind of dumb, really. **- My wife, not being a horror movie fan-- at least, American horror-- was not familiar with these tropes, so much of the meta- aspect of the movie was lost on her. As I mentioned earlier, I'm analyzing a flawed structure as part of an exercise to improve my own writing, specifically using the third "Xindi Arc" season of Star Trek: Enterprise. Now, let's look at the beginning section of the arc, the first third. This would consist of the second-season finale "The Expanse" as prologue, and the first eight episodes of the third season: "The Xindi", "Anomaly", "Extinction", "Rajiin", "Impulse", "Exile", "The Shipment" and "Twilight". In three-act parlance, which I'm not a big fan of, this is all Act I. And, as far as I'm concerned, that's part of the flaw here: these episodes mostly serve to put the pieces on the board, and there really aren't that many pieces. The Prologue set-up of "The Expanse" does its job relatively effectively, but it doesn't quite hold up to scrutiny. Earth is the victim of a Pearl Harbor/9-11 style surprise attack, killing seven million people. The attack comes from a single-occupant probe of unknown origin. Here's where part of the problem comes in: rather than have Starfleet actual figure out its origins, at least in part, answers are handed to Capt. Archer by an exposition fairy from the future. And said answers, as they usual are from poorly conceived exposition fairies, do little more than nudge in the right direction. In other words, the information they gain could have been gained in a less clunky way, and have been just as useful. But "The Expanse" sets the tone, puts a name to the adversary (The Xindi) and a place to find the (The Delphic Expanse). The Expanse, itself, is set up as the equivalent of the "Here Be Dragons" part of the space map: physical laws don't work right there, and it's so dangerous even Vulcans and Klingons steer clear of it. The true "Act I" of those eight episodes serve to establish a few core elements: the dangers of the Expanse (tied to bizarre spacial anomalies), which may be connected to a mysterious sphere; the stakes for the crew of the Enterprise, personally and globally; the Xindi themselves. The problem is, only three of these episodes really effectively achieve these establishment goals: Anomaly, The Shipment and Twilight. The key points in play in this section are tied to what the crew needs and wants. They want to find the Xindi, but they really don't know where to start looking on once in The Expanse. They need to keep the ship safe from the spacial anomalies they constantly run into in The Expanse. For the latter, there is a running subplot involving Trellium-D, a substance that will protect the ship, but that solution isn't acceptable: Trellium-D is toxic to T'Pol, so they can't use it. This ties into the only real character arc in this section: what is Capt. Archer willing to sacrifice to save the Earth? * His morality takes a bit of a pounding here, at one point torturing a captive pirate to get the information he needs. He's also willing to pimp out Ens. Sato to a mysterious alien in "Exile", though that's a sacrifice Hoshi volunteers for. He spends much of these episodes at the end of his rope, because he really doesn't see the mission as anything more than a ridiculous long shot. 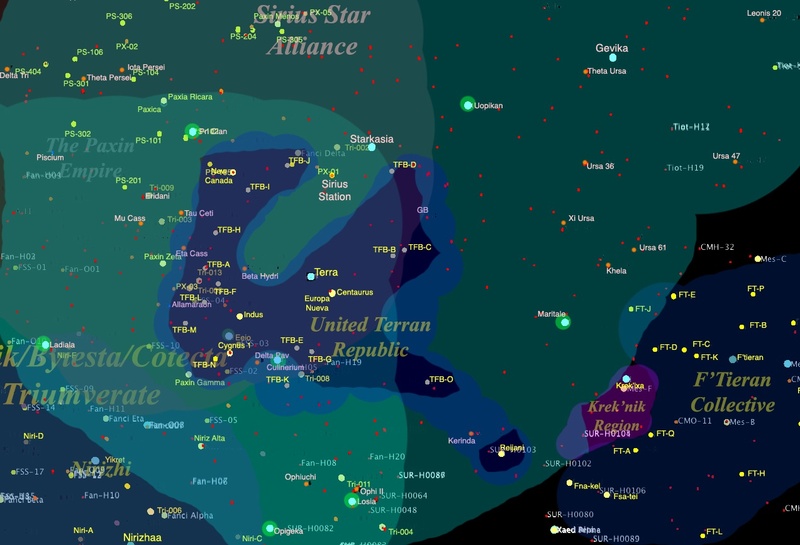 IF they can survive the Expanse, and IF they can even find the Xindi, then they'll still be outnumbered and outgunned. This comes to a head in The Shipment, where they find a Xindi refining facility. The materials made at this facility were used in the weapon of the initial attack, and Tucker, Reed and Hayes are all ready to start blowing things up. Archer, instead, decides to get to know one of the Xindi, and reaches an understanding with a decent man who didn't know what his materials were being used for. Two key things accomplished: The Xindi aren't All Bad, and Archer moral compass veers back towards where Trek's is supposed to be. The final step in this part is in Twilight, a psuedo-time travel story that nails home the stakes of failure: Earth will be destroyed if the Enterprise doesn't succeed in their mission, which they don't due to Capt. Archer being incapacitated by on of the spacial anomalies. It is a classic Trek "reset button", but one with a point. It doesn't just give us craziness and then undo it. Even still, the big problem with the arc in this part is it mostly just meanders. It takes eight episodes to do the work of three or four. ** Extinction, Rajiin and Exile are largely pointless, serving only to provide us with funny make-up, cheap titillation and a poor Beauty-and-the-Beast homage, in that order. When it comes down to it, the first section only really does the work of the first two parts of the Twelve Part Arc Structure, when it should be doing the first four. Once the situation is Established in The Expanse/The Xindi/Anomaly, we don't get back on point until The Shipment/Twilight to incite the plot to really start moving. That aimless wandering in between those points is where an audience is lost. Next up: the mushy middle of the Xindi Arc. *- The other character arcs set-up here are essentially minor bits of business. Cmdr. Tucker is assigned the personal loss from the initial attack (his sister was among the seven million), but this mostly serves as an excuse to push him romantically towards T'Pol. T'Pol's main conflict is resolved in the prologue: the Vulcan High Command don't want her on the mission, but she resigns from the High Command to stay on board. Of the minor four members of the main cast, only Lt. Reed is given anything: bristling against Maj. Hayes, of the newly added MACO forces. **- I'll allow that "Impulse" does a fair amount of work of increasing personal stakes, and ties into what the Enterprise can do to keep themselves safe from the anomalies. Happy Thanksgiving, all. I've got pies and stuffing and turkey to make*, so I won't go on for too long on this post**. I had considered just linking to some past posts, like on worldbuilding holidays or food details. But I didn't want to be quite that lazy. So: state of the writer, thankfulness version. First and foremost, I'm thankful for by amazing wife, whose love and support have kept me going through this journey. She's put up with the many, many times I've stayed awake into the wee hours or sequestered myself with headphones on and nose in the computer, accepted the fact that my head is quite literally in some other world half the time, and has kept the fire under my feet when I get distracted. 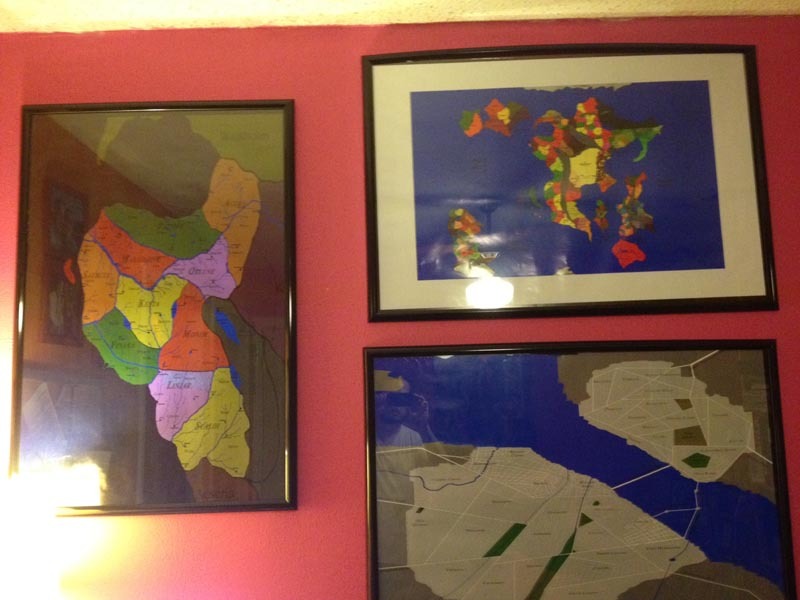 She's willing for me to not only have giant maps printed, but to have them framed and hung in our studio. Thanks to her I've got three novels*** in my agent's hands, and more on the way. Second, my agent. It's hard to quantify what an agent does for someone, but in the time we've been together, he's been a source of support, as well as inspiration. He's pushed those three books into being better than they were without him. He's regularly plugged this very blog. He's working for me, and he doesn't make a dime from me until we have a sale. And when we do, you damn well better believe he's earned his percentage. I sure do. I'm thankful for my health and my energy, and that I've had the ability and freedom to keep working like I have been. I'm thankful that I've just finished a draft of a short story, and wrote another short play last week. I'm thankful that I have more ideas than I know what to do with. Novels are cooking and brewing in this brain, and I have every intention of continuing to crank them out. I'm thankful for all the people who've given help and advice over the past year and more-- from my mentor and friend Stina Leicht to my worldbuilding brainstorming partner Dan Fawcett to the café manager who doesn't charge me every once in a while because she likes supporting writers. Too many people to name. Besides, that's what the acknowledgement page of books are for, right? All right, time to hit the kitchen, folks. Have a good one. *- I'm a traditionalist, but that ties to my roots as a worldbuilder and an amateur food historian. Turkey, potatoes & corn are all native foods to the Americas. That's important, in my mind. That's why desert is a chocolate pecan pie. **- I swear, half the times I say that, I end up writing twice as much as a normal post. ***- And two trunked ones. I don't think anything tests the patience of a writer's spouse quite like a trunk novel. It's a process I really enjoy, and it keeps various tools in my toolbox sharp. This is a key reason why I participate every year. 2000: Last Train Out of Illinois (Selected) My first year with Scriptworks, the rules involved boots, a character directly addressing the audience, and someone performing an "aria". I had, at the time, had the vague idea of a Tom Waitsish Musical called "Last Train Out of Illinois", but all I had was Atmosphere and an Ending. Which is just fine for a ten-minute piece. 2001: Dead Air On The Open Road (Not Selected) I don't remember all the details, but one of the rules here was an "incongruous element". So the story involved people in a car breaking down in the desert, and then a foul-mouthed puppet shows up to save them. When we did the reading, it was actually pretty hysterical, but I can see that as a script, it's rather thin. 2002: Freaks of Nature and Acts of God (Selected) The rules aren't quite in my memory, save "only one chair" as set. I came up with three young women stuck in a near-empty beach house during a hurricane, who are then rescued by a pizza-delivery guy who has the wrong address. It's probably the weakest of mine that was chosen. 2003: Danger Girl's Night Off (Selected) The rules dictated 1. something involving superheroes and 2. a seduction, so I immediately thought of a grown-up sidekick who just wanted to have a date night. This was a lot of fun. Elements of this story ended up fueling the core ideas behind my story in The Protectors, which you can still purchase on Amazon. 2004: Triangles and Broken Circles (Not Selected) The rules had something to do with chalk and a ceremony, but what I wrote was pretty much weak sauce. Can't blame it not being selected. 2005: No Entry. This year, for budgetary reasons (I think, I could be wrong) the format changed, asking for a 5-minute radio play. I was at something of a loss with that idea, so I didn't enter this time around. 2006: Alignment of Celestial Bodies (Not Selected) Of the "not selected" ones, this is probably my favorite. I forget the details of the rules, but it was a sweet romantic story of a couple going stargazing, with an interconnecting Creation-of-the-World Myth of my own creation. 2007: Hourglass (Selected) I'm really pleased with this one. The rules involved 1. A physical transformation on stage, 2. a secret and 3. a piece of music connecting to a memory. This may have been, for me, the most synergous set of rules. The discovery of an old hourglass reminds an old woman of the true paternity of her child. Hannah Kenah did really lovely work on stage going from 107 to 20. 2008: Ten Minutes Ago (Selected) The play goes backwards! That was the rule that had to define this one. The idea I was struck with here was having an innocuous instigation (a woman answering her door) lead to events that had disastrous consequences (her husband and a stranger dead in her living room), and then show it Consequences-Events-Instigation. This one was challenging to stage, but enjoyable. 2009: The Q (Not Selected) Here, I think I bit off more than I could chew. The core idea was about people being smuggled out of a quarantine-zone after a biological attack. I think it ended up too dense and too vague. I like it, I may revisit it at some point, but I'll admit in the writing, I wasn't quite "feeling" it. So when it wasn't chosen, I wasn't all that surprised. 2010: Entropy (Selected) "Time is Running Out", "Use the Beginning and End of Finnegan's Wake" and "A Ceremony of Forgetting". How does this NOT say "two people stuck in a time loop"? OK, it does to me, because I'm a sci-fi geek. 2011: Slept the Whole Way (Selected) Again, the rules sent me to an SF place: the play needed to span 3000 years and have 300 characters. So a cryosleep ship that missed its target and kept everyone in stasis for 3000 years made perfect sense to me. 2012: I Asked My Friend Art, And He Said It Isn't Him. Given that I just sent this, and don't know what it's fate is, I won't talk about it too much. I will say I enjoyed writing it a lot. I found myself cackling and grinning much of the time, and I'm hoping that's a good sign. Sometimes it just doesn't come together. And that's okay. I'm in a strange position, writing-wise. Three novels are out there, shopping at various publishing houses. Any or all could hit tomorrow, or in a month or six months or never. * If and when that happens, I need to be ready to shift focus to the Needs of Publication-- including and not limited to starting the Book II of whatever series hits. This is all a rather long-winded way of me saying that no one, with the possible exception of my agent, is really asking for Way of the Shield to be written right now. And I'd be willing to bet if I sent him something else, say something space-opera, my agent wouldn't complain. And that's what you have to do sometimes: listen to the Muse, and figure out where it's taking you. Ignoring it, frankly, just makes everything work slower. And that doesn't mean one project is dead because focus is shifted onto another. Quite the opposite. It's getting a chance to breathe. *- Personally, I'm hoping more in the tomorrow-to-a-month range, myself. **- Strictly speaking, Way of the Shield takes place about a week after the end of Holver Alley Crew, which itself starts about a week after Maradaine Constabulary, which starts three days after the events of Thorn of Dentonhill. Yes, I have a whole calendar. Yes, I am that obsessively detail oriented about these things. ***- In fact, that's pretty damn pie-in-the-sky. ****- Her language is a bit coarser on the subject. Sailor's mouth on that one. Let's face it: democracy is not a key factor in most fantasy fiction. It is a genre that has its foundations built on a primarily European-based aristocracy/nobility model. One of the tired tropes of the genre is the idea of rule-through-birthright: the king of Return of the King is the great-to-the-infinite-power grandson of a long-gone king, and the rulers of Gondor are "stewards" who have essentially been waiting for an heir of Isildur to bother to show up and claim his throne. Same thing in The Belgariad: Garion is the heir of the secretly-preserved line of Riva, and the empty throne has waited for the Rivan King to show up for 800 years. Seriously, these are some patient people, since they go centuries working on the premise of, essentially, a temporary regency waiting for the "proper" ruler to show up, even though the ancestor who last occupied the throne is long out of living memory. * Why do they put up with this? Because, apparently, in this type of fantasy, birthright never fades. Nobility is important. But, while I have those European nobility influences-- Druthal has a king, not to mention archdukes, dukes, earls and barons-- it also has a Parliament. An elected Parliament, where the real legislative power lies. Democracy is a crucial element of how Druthal works. The people's voice is important, even if it gets corrupted and twisted and bought out from time to time. I am having fun with that in Way of the Shield, where the partisan make-up of the Parliament, how various aspects of the press interpret what the Parliament does, how people feel about the Parliament (ESPECIALLY Dangerous Fringe Elements) all come into play. It's messy, because democracy is messy, which is how I like it. I won't get too political here, but the thing I love about democracy is the element of dissent and disagreement. I love that I can have an enormous, pitched argument with someone on the polar opposite side of an issue, and the end of the day, we'll both think the other guy is just plain wrong, but neither of us is going to get taken in by the police in the middle of the night for what we said. And in a little bit, we're going to have an election, and shortly afterwards a little more than half of us will be pleased, and a little less than half will be pissed. But that little-less-than-half will dust themselves off and gear up for the next fight. And that's awesome. That's what it's about. And, hopefully, I can work a bit of that into by fantasy writing, and get some good drama out of it. *- Essentially, even though both LOTR and Belgariad have functionally-immortal characters. Strictly speaking, there is living memory of Isildur and Riva, but it's not amongst the common people living day-to-day under the regency rule. **- Also note, this is just an incident in the extensive history my insane-worldbuilder brain has created. It's three centuries before the stories I'm telling. ¡Feliz día de los muertos! We're now in November, which for some writerly types, means NaNoWriMo, aka Nation Novel Writing Month. If you aren't in the know, participants pledge to write a 50,000 word novel over the course of November. This translates to writing approximately 16,666 words a day. Back in the early days of writing, I participated, but I don't anymore, since every month is Novel Writing Month, and at this point in my life, a pace of 50K a month for 12 months is not something I could ever hope to maintain. Writing at my own pace is just fine by me. But exercise and process are important, especially when it comes to getting started. Getting a novel started is, for me, a very slow and deliberate process, in that the path from conception to writing actual text can take quite some time. I sometimes make the metaphor of my writing brain being like a kitchen, with various projects on front and back burners. But then there is other stuff in crockpots on back counters, slowly stewing away for years until they are really ready to work. Once I have an idea, I need to build the place where it unfolds. I'm a worldbuilder, it's what I do. For me, this phase is all too crucial: it's about placing the gears that will power the engine behind the story. This phase can often be the longest, because it is filled with working and reworking things out. If it doesn't work, if it doesn't make sense to me, then the center doesn't hold. 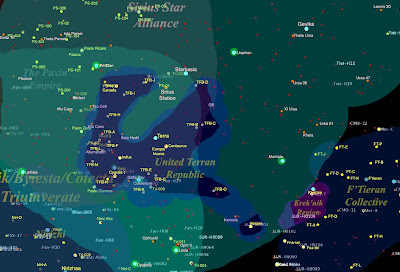 Case in point: when I initially conceived my Space Opera Setting, back in 2002, I created some initial star maps with colonies and alien homeworlds and such and so forth. But as I first tried to write, this signal of WRONG WRONG WRONG across my brain was jamming things up. Why? It took a while to realize, but I finally hit upon it: the stars of these colonies and alien worlds, while being in close proximity to Earth, had nothing to do with actual stars close to Earth. Back to the drawing board. I put these two together like this because they tend to go hand in hand, but I can't honestly say which one goes first. Both things are crucial to figuring out what the actual story is: what's happening, and who it's happening to. It's a strange, intertwined process that, frankly, I haven't quite mastered. Trying to craft circumstances without knowing character at the center can yield something soulless and mechanical. But crafting characters without really knowing the story can make an unholy mess, where you end up with numerous people standing around with very little to do. The best solution I've found is to, at this phase, focus on just the core characters and the ripe circumstances that initiates things, and let it flow from there. Now that I've worked out the key elements, who, what, where, when and (to a degree) why, it's a time for a big helping of how. Of course, I use my Twelve-Part Structure as a base, writing out about a paragraph for each part. With that finally in hand, THEN I can start Actually Writing. *- I gave it significant editing afterwards. It's still a trunk novel, and that's what it deserves, frankly. **- This is where those, "I've got a great idea for a book, so you write it and we'll split the profits!" pitches come from.